This chapter begins Part 2 (The Character of Technology), the first half of which (chs 8-12) aims to describe and articulate the paradigm of technology, and the second half of which (chs 13-16) aims to ask how we have come to terms with technology politically and socially. 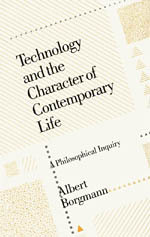 The thesis which Borgmann will be following throughout is that technology, as the characteristic way we engage with the world, is guided by a basic pattern. This pattern, however, like many deeply ingrained patterns, can be impossible to see. This is essentially the observation that the features of our worldviews which are fundamental (in the “background”, so to speak) are themselves not open to our introspection without some serious effort. That effort for Borgmann is put to use in returning to the first articulations of technology. They go back to the founding event of modernity: the Enlightenment. The Enlightenment was the original modern liberation movement, and thus technology (as a liberating force) is usually seen as a corollary of it; Borgmann claims, to the contrary, that technology is a primary current in that stream. Descartes, for example, calls out technology as an obvious tool of intellectual liberation, describing its potential for self-determination (making us “masters and possessors of nature”), for freedom from labor, and for freedom to enjoy one’s faculties. The proper grounding of this vision was not seen until the middle of the 19th century, however. Before that, machines and efficiency multiplied, but with a corresponding degree of toil and misery. Eventually, industrialized nations saw the fruits of the new technological order, and strong arguments indeed can be made for the disburdening character of technology (disburdening us from disease, hard manual labor, etc…). This promise of technology (of self-determination and freedom) is reiterated constantly in all kinds of social and political rhetoric. The implication is that the mature technology of an advanced industrial society is continuous with the liberating technology which, for example, helped more and more people survive and do business in North American winters. Borgmann doesn’t take this for granted, and offers modern advertising as an example of the macabre and seemingly trivial ends to which technology is now put. Marketers selling us “world-class cuisine” without leaving home (through the use of the microwave) seems somehow hollow when put next to vaccinations of serious diseases. So, we can ask several questions about the promise of technology. Can technology be successful in delivering this promise, even on its own terms? Will it impose new burdens to replace the old (a pernicious irony which can be seen quite clearly in the traffic jam, for example). Can it fulfill its promise in a just way, without merely sweeping toil under the rug of the developing nations? And finally, is the promise well-conceived and worth keeping to begin with? The promise presents the character of technology in broad outline. It is essentially “the general procurement of liberty and propserity in the principled and effective manner that is derived from modern science” (39). But is this outline too broad? Does it allow for technology to descend into meaningless “improvements”? As Borgmann says, “Initial genuine feats of liberation appear to be continuous with the procurement of frivolous comfort” (39). If this is the case, it is perhaps worrying. Ok, now we start getting into the heart of the matter. An important issue that Borgmann is beginning to balance here is what I would call an internal-external perspective. We have access to both views as technology is ultimately a human fabrication (Heidegger) yet one that shapes how existence is engaged, not just a timeline that is a problem-solving human computer interaction.